For P/O John Watson and the crew of Wellington X3359 the night of June 16th on a mission to Essen would be one of loss and imprisonment for two the crew. For the two remaining members of the crew John Watson and Bruno Angers it would become a story of evasion and a long dangerous path back to home. The tragic loss of the aircraft's pilot F/S Charles LeBlanc, affectionately known as "Little Bomber" and "Pee Wee " by the crew, who stayed at the controls of the aircraft too long to safely bail out. After Navigator P/O Watson, the last to bail out, the nineteen year old pilot decided to make a crash landing. Which he skilfully did. If he had been able to reattach his seat belt, which he had unbuckled to get into his chute, he would have survived the crash. Unfortunately he was thrown forward and died of a fractured skull. He had saved his crew but was unable to save himself. The events of what happened that night aboard Wellington X3359 have a few variations, I believe the MI9 reports given by P/O John Watson and Bruno Angers another member of the crew who became an evader, provide the best eye witness accounts. Also John Watson later wrote a letter to the family of Emile LeBlanc the aircraft's pilot, in which further details are given. Here is how these reports and the letter piece the story together. Returning from a raid on Essen on June 17th 1942 while flying at 17,000 feet near Limburg, Belgium the starboard engine failed. Watson noted in his letter to the LeBlanc family that normally that would not stop them from reaching England safely. He goes on to mention that the icing conditions were very severe and the aircraft had dropped 13,000 feet in seven minutes. Two other of the returning Moose crew also reported icing conditions being severe. The icing on the wing surfaces would have caused the loss of lift and the controls would have not responded as they normally would have. In a book of notes on handling Wellingtons gathered by ATA Ferry Pilot's it states that once an engine fails the aircraft will be pulled off course, it also mentions that the Wellington can fly on one engine but not as easily. These characteristics plus the disturbance of the air flow over the wings caused by the ice must have taken a great effort to try and keep on their proper course. The route back to base, as gathered from other crew reports in the squadron records, took the bomber stream to the North of Antwerp and South of Rotterdam, thus avoiding the heavy anti-aircraft defences of those two cities. It would be the loss of control which brought X3359 over the Antwerp defences which fired upon the Wellington. According to Watson and Angers the Wellington was hit by flak and order to bail out was given. Sgt. Bradley helped LeBlanc into his parachute, one which the nineteen year old pilot would not have the chance to use. Watson the last to bail out states that he left the aircraft at 1,000 feet fully expecting his pilot to jump next. 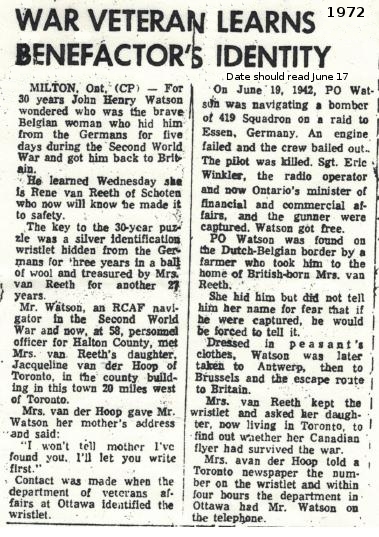 Another detail of what happened that night can be found in a letter to LeBlanc's family by a cousin serving in the Canadian Army in Holland who had interviewed the girl who found the crashed Wellington. She stated that the crash came at around four thirty in the morning and that indeed the young pilot was killed in the crash. Watson was the last of the crew to evacuate the damaged Wellington, by now the aircraft was down to a dangerous altitude for jumping, 1,000 feet . Even so, he managed to land make a better landing then his fellow evader to be Joseph Angers, Watson managed to land in a row of bushes softening the impact with the ground. His only problem was the loss of one of his boots. Deciding to dispose of the other to make for easier walking, which proved to be not so much of an help as hoped. He came across two women on bicycles who guided him to a Flemish farm, where the family gave him a meal, a coat, a bicycle and wooden clog shoes for his feet which by now had become painful from all the walking without shoes. Two women guided him Northward after an hour of pedaling and passing two large formations of German troops they reached another house where he was connected with the underground organization that would eventually bring him home. On June 17 , I was resting at the house of Mrs. Van Reeth, whose husband runs a lumber business in Antwerp, while she established contact with a lawyer in Antwerp on my behalf. She cycled with me to Antwerp on that afternoon and took me to this lawyer's house. He was a member of an organization, but had done no work for the organization for six weeks. On June 18 at 1400 hrs he accompanied me with another lawyer by train to Brussels, where I was taken to meet a young photographer of 20 years called Albert Petite. (Auguste Bourlon) The latter took me off by train to his home in Namur, and provided me with the photographs and identity card. I stayed with him until June 20 when the Burgomaster of Dhuy ( Jules Dubois) came to fetch me in a car and takes me to the house of M. Mme Vitry in a village near Franiere, 5 miles W SW on Namur. here I lived "like a King" on country food till the 24th of June. I was told the official appointed by the Germans, regularly cheated the Germans with impunity. On June 24 the Burgomaster drove me to a house at Upigny, about 7 miles North of Namur and near Dhuy, picking up F/S Bernard Evans on the way. On June 27th he drove the pair of us to Namur where we met two guides, who accompanied us by train to Brussels. At this point my account is the same as the that of Sgt. Evans until July 16th when I left Paris with two guides for St. Jean de Luz, the party consisting of the two guides, the original DIDI, Angers, Evans, a Polish airman and myself. On Arrival at St. Jean De Luz the woman at our rendezvous refused to help us, since the Germans had unexpectedly begun to patrol the frontier on that day: but our guides succeed in finding a farm, to which we went before setting out across the mountains at 2245 hrs. At about 2330 hrs two French gendarmes surprised us, firing their revolvers. The rest of the party got away but I was caught and searched. When I declared that I was English they became friendly, although I had actually clouted one of them on the head. in fact, our way back deliberately avoided a German patrol on my behalf. They took me to Booby where I spent the night in the prison. at 0700 hrs. June 19, I was interviewed by a sergeant of the gendarmes and interrogated about the organization which was helping me across the river into Spain that night. My cell was left unlocked and I was fed very well. Ay 2200 hrs I went to his office, and he drew me a map showing me how to avoid the German patrols. He then led me to a spot where I was able to swim the river. I dressed on other side and walked to a point two kilometres short of San Sebastian, arriving there at 0430 hrs Here I asked a man the way to the British Consulate, but he in the hands of the new special Spanish Police force. I was detained until 1000 hours of July 20 and was then slightly interrogated by a civilian. A severe interrogation by the Chief of Police post followed, mainly concerning the organization. I returned evasive answers, ,and after they had taken all my personal possessions away from me, they took me to prison in San Sebastian where I remained for six weeks, being transferred to Miranda on Aug 29 1942. The conditions in San Sebastian were bad. The food was "awful", but after four days I received parcels from the Consulate. I was treated with great rudeness. I left Miranda on Sept 30 for Madrid. Here I went under only a slight interrogation and the conditions were much freer. I stayed for ten days in Madrid at the Hotel Mora. On Oct 1st I left Madrid for Gibraltar. Mme. Van Reeth takes Watson to a lawyer and next day the lawyer and a colleague travel to Brussels w here John Watson is introduced to photographer Auguste Bourlon, code named "Albert Petite" . Auguste along with Watson travel by train Auguste�s home in Namur and he gets an orange ID card. On June 20 Jules Dubois mayor of Dhuy and local timber merchant brings Watson to Dhuy by car, where he stays at Mr. and Mrs. Vitry�s home in a village near Franiere. Here he lives well with the benefits of what food stuffs the mayor manages to cheap the Germans out of. In his own words "Lives like a king" Then June 24th Debois guides Watson to a house of Baron Louis Jamblinne in Upigny a near by village, picking up Sgt. Bernard Evans on the way. On June 27, Jules leads both the airmen to Namur where they meet guides Robert Bayard and Suzanne Nicolas Laurent his fianc�e. They take Watson and Evans to Brussels where they meet another contact John Greindl at a Swedish canteen where there is also an Andree Dumont code named "Nadine" (Andree is noted as being the father of "DIDI 2"). Then later Andree drives them to a house where they stay for four days and providing them with fake ID papers. July 1 Andree Dumont leads Watson, Evans and a RAF flyer Joe Pack to the Paris train. At the Belgian � French border Watson has problems answering the officials questions, Andree explains the three are all dumb and manages to pass through the check point with that explanation.. Andree then takes them to Hotel de Luxembourg in the Latin Quarter where they meet up with Fredrick De Jongh. De Jongh who is noted as being Andree�s father arrives later moves the three air men to house in the Val de Marne area. "Nadine" then is free to return to Brussels. The group now includes Watson, Angers, William MacFarlane (a scots soldier), Marian Zawodny (Polish airman), and Joe Pack. Pack and MacFarlane are moved off to follow another route via Raymonde Coache via Asnieres. July 16th the four airmen guided by DeJongh and "Elvira" (Morelle) are guided to the train to St. Jean de Luz , carrying false papers. At Bayonne they are joined by Elvira DeGreef and "B" ( Albert "Bee" Johnson) The station is crowed with Germans unloading equipment so the normal exit is blocked and they are forced to go through the customs and do so without any problems. The group is split up and proceed to San Vincenete where Ambrosio Salagoiti houses them for two days with the help of Maritxu Anatol ( who will later intervene with the French police for the release of Watson ) then to a farm of Francoise Usandizaga 10 km away in Halzuet. To cross the border DeJongh requires and three Basque guides, Manuel Tomas, Iturrioz Anabitarter with Donato Errazti providing forward guard. While not a proper translation of the wording it is close .